We recently nominated Dr Harriet Williamson for the RCGP Mersey GP Award in recognition of all her hard work and achievements since joining the Practice in 2015. Harriet continuously looks at new and innovative ways of working to improve patient care and practice efficiencies. She has been passionate about GP training and has been a driving force behind us being approved as a new GP training practice. Harriet's recent accomplishments also including being appointed Primary Care Medical Educator for HEENW and becoming a registered FSRH trainer. Harriet’s success in becoming a GP Trainer and Educator is a true reflection of her forward thinking and dedication to General Practice. Harriet also has a keen interest in and has initiated improvements with our sexual health services. Have you told us that you're a carer? Let us know by filling in the attached form and handing it back to the surgery so that we may support you in supporting others. Please note that as of the 1st of April 2018 there will no longer be a “Boughton Well Baby Clinic” running from these premises. 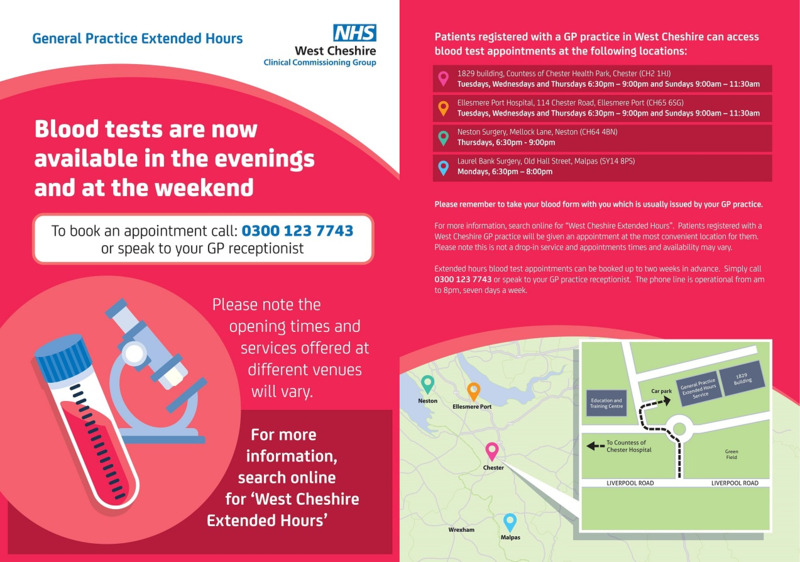 Patients who are registered at this practice can now book an appointment to see a GP or nurse on weekday evenings (after 6.30pm) or at the weekends (on Saturday and Sunday). Appointments after 6:30pm will take place at other NHS sites such as other nearby surgeries or hospitals. Talk to one of our receptionists to find out more or book an appointment. These appointments are known as 'extended hours'. 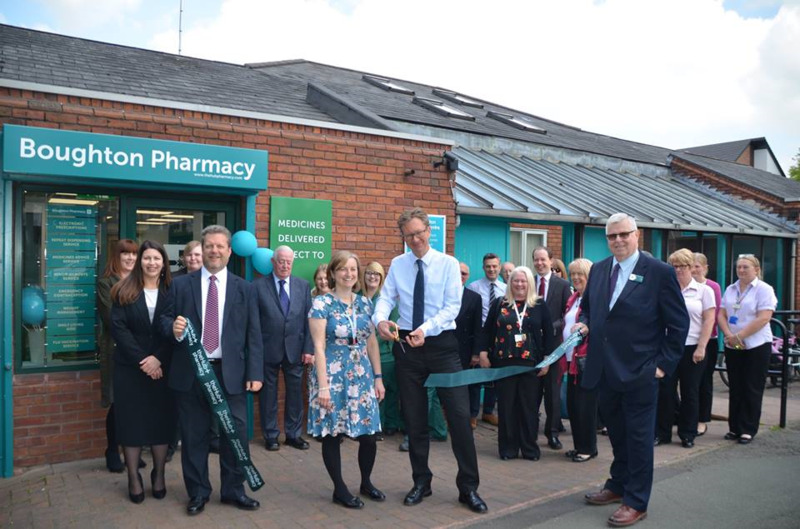 On May 2nd, The Hub officially opened their Boughton Pharmacy at Boughton Health Centre. Dr. Steve Kaye performed the ribbon-cutting ceremony and we look forward to working with them in the years ahead. For more information about the services they can offer, please see our Pharmacy First page or visit The Hub Website. Even though you might be feeling great, if you’re over forty you may be at risk of heart disease, stroke, kidney disease, diabetes or dementia. A NHS Health Check can help you reduce these risks and make sure that you stay healthy. Please contact the surgery to make an appointment. The number of children catching measles is rising. The MMR vaccination immunises against measles. Please click here to view the latest NHS poster. If you require more information please contact the surgery. The Practice is delighted to have been awarded “GP Practice of the Year 2016” at the recent West Cheshire Clinical Commissioning Group Awards which took place at Chester Racecourse. The nomination focused on how we actively explore ways of addressing challenges and current demands by making use of information technology for patients. The Practice has an embedded culture of offering on-line services to our patients and was one of the first practices to do this 6 years ago with access to booking appointments and ordering repeat prescriptions, so the natural next step was to provide full access to on-line medical records. Empowering patients to take a more active role in improving/maintaining their health and wellbeing and feeling involved in their decision making was paramount to the Practice. The Practice is currently running an awareness campaign in conjunction with the Patient Participation Group (PPG) to offer virtual access to be involved with our PPG. You may need to add us to your safe-senders list if you find the newsletter in your Spam folder.